Relive the exciting days of the "fiery chariot" with this ready-to-be-assembled model of a steam-driven passenger train. 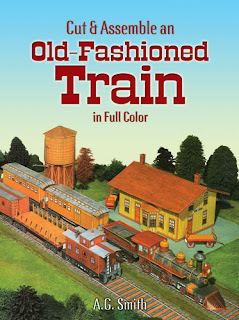 Meticulously rendered replica includes a locomotive, passenger car, boxcar, and caboose. Complete illustrated instructions ensure easy assembly. Water tower (6¼ inches tall) and station (8¼ inches x 5 inches x 4 3/4 inches) also included.